If you want to help people live better, more fulfilling lives, then you should consider an online master’s in Psychology. Psychologists enjoy strong job prospects and exceptional earning potential. The U.S. Bureau of Labor Statistics projects that employment for psychologists will increase by 14% between 2016 and 2026 — double the growth rate for the rest of the economy. In 2017, psychologists earned a median salary of &dollar;77,030, more than twice the median pay for all other occupations in the United States that year. The top 10% of psychologists commanded salaries in excess of &dollar;124,520. To enter this growing and lucrative field, however, you must hold an advanced degree. Master’s graduates qualify for positions in school and industrial-organizational psychology, but you must earn a doctorate in psychology to take on clinical, counseling, or research roles. Many doctoral programs, especially those offered online, require prospective students to hold a master’s degree before applying. 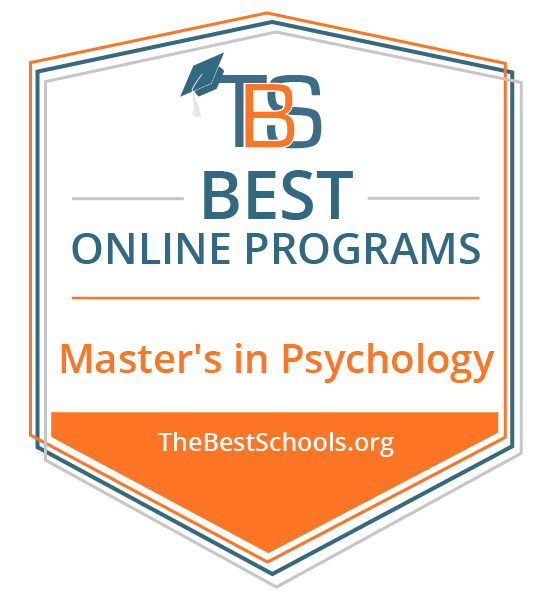 This page provides an overview of online master’s in psychology programs, including the advantages they offer to working professionals and single parents, guidance on finding a program that fits your unique needs and professional goals, and potential career paths to follow after graduation. It also features a ranking of the best online master’s in psychology programs in the nation. What Is a Master’s in Psychology Degree? With roots dating back to the founding of the University of Southern California in 1880, the Dornsife College of Letters, Arts, and Sciences provides undergraduate, graduate, and professional programs with a long history of tradition in education. Housing 35 departments, the College represents a diverse array of fields of study, including Anthropology, Economics, Linguistics, Mathematics, and Psychology. Students in the Department of Psychology benefit from access to internship, practicum, and study abroad opportunities, student organizations like Psi Chi, the International Psychology Honor Society, and the College’s many research centers and institutes. The Department of Psychology offers an online Master of Applied Psychology degree program that prepares students to utilize psychology principles in diverse professional settings, both inside and outside of the field. The program develops a balanced foundation of knowledge and skills drawn from the study of psychology and emphasizes their application in common professional settings. The curriculum includes coursework in areas such as business psychology, organizational psychology, the application of psychology principles, and the analysis of quantitative data. Students prepare to pursue a wide variety of career paths, including market analyst, human resources manager, public relations director, and career counselor. Students in the online Master of Applied Psychology program must also complete a practicum. The program may be completed in as few as 16 months. Students may pursue an optional summer internship in Dublin, Ireland. Penn State World Campus, the online and distance education wing of Pennsylvania State University, enrolls over 8,000 students in a full array of online programs. Through plenty of online resources, professional development services, and internship and scholarship options, Penn State World Campus meets the unique needs of non-traditional students at all levels of study. Penn State World Campus offers an online Master of Professional Studies in Psychology of Leadership degree program for students seeking to advance as leaders in a variety of professions. Through a comprehensive blend of core and elective coursework, students examine and practice leadership models with a strong psychological backing. Students engage with a variety of concepts, including psychology and ethics, group psychology, managing dysfunction, and cross-cultural leadership. Students prepare to advance in a variety of professional roles as managers, directors, administrators, and executives. Students in the online Master of Professional Studies program must also complete a capstone experience. The College of Arts, Sciences, and Business at Missouri University of Science and Technology provides a variety of undergraduate, graduate, and professional programs across multiple fields. With numerous departments, including the Department of Psychological Science, as well as a variety of resources including online program options, and internship and scholarship opportunities, the College serves the educational needs of a diverse student population. The Department of Psychological Science offers an online Master of Science in Industrial-Organizational Psychology degree program designed to prepare students for applying psychology in professional organizational settings. The program develops a strong foundation of knowledge and skills in psychology and business management. Students engage in a curriculum that includes topics like leadership theories and practice, psychology of leadership and group psychology, personnel selection, and more. The program includes thesis and non-thesis options for completion. Students prepare to pursue a variety of careers, including human resources manager, personnel manager, and chief executive. The program utilizes a synchronous delivery model for courses, with live streaming video and collaborative learning software. The Department of Psychology at the University of North Dakota offers a variety of undergraduate and graduate psychology programs, with several routes for niche study. Housed in the College of Arts and Sciences, students in the Department of Psychology enjoy several benefits, including online program options, internship and scholarship opportunities, professional development services, and student organizations. The Department of Psychology offers an online Master of Arts in Forensic Psychology degree program that prepares students to apply principles of psychology in civil and criminal justice system settings. The program develops a strong foundation of knowledge and skills necessary to success in a variety of forensic psychology professions. The program covers key topics of the field, including social and behavioral psychology, psychology in law and legal settings, assisting lawyers, testifying as an expert witness, and addressing forensic issues. Students emerge prepared to enter or advance careers as forensic psychologists. Students in the online Master of Arts in Forensic Psychology program must also complete an independent study, as well as a capstone experience with a one-week on-campus residency. The College of Psychology at Nova Southeastern University provides students with a wide selection of undergraduate, graduate, and professional program options in the field of psychology. With a focus toward developing well-qualified psychology professionals in diverse fields, the College of Psychology emphasizes the development of professional skills alongside core psychology theoretical knowledge and practices. The College of Psychology meets the needs of students through a variety of flexible online programs, professional immersion and internship opportunities, community-centered outreach programs, and opportunities for involvement in research and professional presentations. The College of Psychology offers an online Master of Science in General Psychology degree program with three track options, including a General Psychology Track, an Applied Health Science Track, and a Diversity Studies Track. The program prepares students for a variety of careers in general and niche areas. The curriculum includes core coursework in key aspects of psychology, such as social psychology, growth and development, and research design, as well as specialized knowledge in areas such as gay and lesbian studies, psychology in relation to the treatment of disease, and human sexuality. Students prepare for careers in diverse fields such as education, human services, counseling, and allied health, as well as future doctoral studies. Students in the online Master of Science in General Psychology program must complete a comprehensive exam and may choose to complete a master’s thesis project. The Division of Psychology at Pepperdine University provides students with undergraduate and graduate program options for studying the field. Making up half of the Graduate School of Education and Psychology, the Division serves students through on-campus and online resources, field experience opportunities, and online program options. The Division of Psychology offers an online Master of Arts in Psychology degree program with for students seeking to advance in psychology professions. The program utilizes a blend of in-depth coursework and hands-on experience. Students engage with key concepts of the field, including assessment and treatment methods, social psychology, and counseling in multicultural settings. Students emerge prepared to pursue a variety of jobs, including clinical psychologist, care coordinator, child development specialist, and program manager. Students in the online Master of Arts in Psychology program must also complete a capstone experience. Pepperdine University is accredited by the WASC Senior College and University Commission (WSCUC). One of three schools housed in the College of Health Sciences at LeTourneau University, the School of Psychology and Counseling provides students with a variety of undergraduate, graduate, and professional program options, available on campus or online. Maintaining its commitment to LeTourneau University’s Christian mission, the School of Psychology and Counseling includes strong Christian teachings in its many programs. The School provides students with access to internship and scholarship opportunities, student organizations, and professional development services. The School of Psychology and Counseling offers an online Master of Arts in Psychology degree program that integrates Christian principles into the study of the psychology field. The program develops a balanced foundation of knowledge and skills necessary to the application of psychology principles in diverse fields, while emphasizing its relationship to Christian values and teaching. The curriculum includes coursework in key areas such as counseling, ethical and legal standards, family assessment, and integrative theology, utilizing theoretical and hands-on approaches. Students prepare to pursue a variety of careers, including mental health counselor, marriage and family therapist, school psychologist, behavior analyst, and human resources manager, as well as future doctoral study. Students in the online Master of Arts in Psychology program must also complete a field experience. One of seven colleges at Ball State University, the College of Sciences and Humanities provides a variety of undergraduate, graduate, and professional program options. The College features numerous departments that span a diverse array of fields, including the Department of Psychology, and offers benefits such as online programs, and internship and scholarship opportunities. Through the Ball State Online platform, the Department of Psychology offers an online Master of Science in Quantitative Psychology degree program with a Quantitative or a Mixed Methods concentration option. The program utilizes a blend of comprehensive coursework and in-depth research in a thesis project. The program emphasizes key concepts, including developing and implementing research, assessing and drawing conclusions from data, and applying information from research and the social sciences to make real world decisions. Students enhance their ability to succeed in a variety of professional settings, including testing and assessment companies, corporations, and universities. Students in the online Master of Science in Quantitative Psychology program must complete a thesis. The New College of Interdisciplinary Arts and Sciences at Arizona State University provides a variety of undergraduate and graduate program options in diverse fields of study. With online program options, internship and scholarship opportunities, student organizations, and research labs, the New College serves both traditional and non-traditional students. Through the ASU Online platform, the New College of Interdisciplinary Arts and Sciences offers an online Master of Science in Psychology degree program for students seeking advanced knowledge in the field. The curriculum blends research methods, theory and practice, and an in-depth culminating project. A large portion of the curriculum consists of elective coursework, allowing students to discover and pursue their specific career interests. Students engage with key and niche concepts in psychology, preparing for careers in government agencies, clinics, and corporations. The College of Arts and Sciences at Sacred Heart University provides a wide selection of undergraduate, graduate, and professional programs through many different departments representing a diverse array of fields, including Biology, Music, Middle Eastern Studies, and Psychology. The College offers students the benefits of internship, study abroad, and scholarship opportunities, outreach programs and research centers, and student organization chapters, such as Psi Chi, the International Psychology Honor Society. The Department of Psychology offers an online Master of Science in Applied Psychology degree program with three concentration options, in General Applied Psychology, Industrial-Organizational Psychology, or Community Psychology. The program develops a foundation of knowledge and skills necessary to the successful application of psychology principles to real-world professional situations. The curriculum emphasizes key aspects of the field, including identifying psychopathology, applied research methods, program evaluation, social psychology, and ethical issues and concerns. The program provides a flexible approach to the completion of the degree, blending coursework and hands-on approaches. Students prepare to pursue a variety of careers in diverse professional settings, including non-profit organizations, private business, governmental agencies, education, and research, as well as future doctoral study. Students in the online Master of Science in Applied Psychology program must also complete a comprehensive exam, a thesis project, or an immersion experience to complete the program. Sacred Heart University is accredited by the New England Association of Schools and Colleges (NEASC). The School of Arts and Sciences at Saint Leo University provides undergraduate, graduate, and professional programs in a diverse selection of fields of study, including mathematics, political science, English, and psychology. Building on a liberal arts core, the School of Arts and Sciences prepares students for future careers and graduate study through emphasizing global understandings of subjects and strong analytic and critical thinking skills. The School provides students with access to student organizations, internship and scholarship opportunities, unique events and conferences, and professional development services. The School of Arts and Sciences offers an online Master of Science in Psychology degree program that prepares students for a variety of careers in the psychology field. The program develops a comprehensive understanding of a wide range of psychology theories and practices, with the goal of understanding human behaviors and motivations. The curriculum blends coursework from general psychology as well as social, developmental, and physiological psychology. Students develop the skills and knowledge necessary to succeed in a variety of careers in private, non-profit, and governmental settings, such as data analysis, human resource analysis, college education, and management, as well as future doctoral study. Students in the online Master of Science in Psychology program must also complete a capstone project. The Master of Science in Psychology utilizes a cohort model, with cohorts consisting of no more than 15 students, and courses delivered one at a time in eight-week terms. One of four schools at Touro University Worldwide, the School of Psychology provides undergraduate, graduate, and professional options for studying the field. In keeping with the mission of the university, the School of Psychology serves non-traditional students through flexible online programs and a variety of resources. The School of Psychology offers an online Master of Arts in Psychology degree program with three concentration options, in Media Psychology, Educational Psychology, and Health Psychology. The program develops a strong foundation of knowledge and skills necessary to a variety of professions. Regardless of the concentration chosen, students engage with concepts such as developmental psychology, applied psychology, group psychology, consumer psychology, and ethics. Students prepare to pursue careers in diverse settings, including clinical psychology, criminal justice, business and corporations, and marketing. Students in the online Master of Arts in Psychology program must also complete a capstone project. Touro University Worldwide is accredited by the WASC Senior College and University Commission (WSCUC). The College of Online and Continuing Education at Southern New Hampshire University provides non-traditional students with over 200 career-focused degree program options at all levels of experience. With plenty of options for study, career development services, and internship opportunities, the College meets the unique educational and professional needs of non-traditional students from diverse backgrounds. The College of Online and Continuing Education offers an online Master of Science in Psychology degree program with three concentration options, including: Child and Adolescent Development Psychology; Forensic Psychology; and Industrial Organizational Psychology. Students develop a balanced set of knowledge and skills necessary to successful practice of psychology in a variety of settings. The program emphasizes core values of the field, including advocacy, adaptation, constant growth, empathy, and ethical integrity. The courses cover fundamental areas of the field, including cognition, social psychology, and research methods. Students prepare to pursue relevant careers in a variety of professional areas, including health services, criminal justice, human resources, or education, as well as future doctoral study. Students in the online Master of Science in Psychology program must also complete a capstone project. The program can be completed in as few as 15 months, with courses utilizing a 10-week term model. The Edward S. Ageno School of Business at Golden Gate University provides undergraduate, graduate, and professional programs in diverse fields. With plenty of resources and flexible program options, the Ageno School serves the needs of busy, working professionals and non-traditional students. The Ageno School of Business offers an online Master of Arts in Industrial-Organizational Psychology degree program for students seeking to enter or advance in the field. The program develops a balanced foundation of knowledge and skills through coursework that discusses theoretical and practical approaches to industrial-organizational psychology. The curriculum includes research and evaluation methods, discussions of ethical issues, social psychology, and behavior and motivations. Students prepare to pursue a variety of careers in diverse professional settings, including corporations, health care, government, non-profit organizations, and education. The College of Behavioral and Social Sciences at California Baptist University provides undergraduate and graduate program options in a variety of fields. In keeping with the Christian mission of the university, the College integrates Christian teachings into its programs, studying behavioral and social sciences from a Christian worldview. The College serves traditional and non-traditional students through flexible online programs, field experience opportunities, scholarship options, and professional development services. Through the CBU Online platform, the College of Behavioral and Social Sciences offers an online Master of Science in Counseling Psychology degree program for students seeking to enter or advance careers in a variety of counseling areas. Through a blend of in-depth coursework and field experience, students develop a strong foundation of knowledge and skills in the field. The curriculum covers a comprehensive array of subjects, including counseling theories, child and family counseling, addiction counseling, domestic violence, psychopharmacology, and ethics. Students may also choose to complete an optional Licensed Professional Clinical Counselor concentration. Students prepare to pursue careers such as behavioral counselor, family counselor, addiction counselor, and case manager. Students in the online Master of Science in Counseling Psychology program must complete a practicum. The program requires that students also complete 24 hours of individual psychotherapy, or 50 hours of group psychotherapy, outside of the campus community. The School of Graduate Studies provides graduate degree programs across a variety of fields. With plenty of resources, internship and scholarship opportunities, professional development services, and online programs, the School meets the needs of traditional and non-traditional graduate students. The School of Graduate Studies offers an online Master of Arts in Counseling Psychology degree program for students seeking to advance in counseling careers. The program utilizes a comprehensive curriculum, covering key subjects like family counseling, addictions counseling, assessment and treatment, psychopathology, and group counseling. The curriculum blends theoretical coursework with practical, hands-on experience. Students enhance their ability to occupy a variety of professional roles, including family counselor, addictions counselor, professional mediator, and marriage counselor. Students in the online Master of Arts in Counseling Psychology program must complete a practicum. Southwestern Assemblies of God University is accredited by the Southern Association of Colleges and Schools Commission on Colleges (SACSCOC). The College of Arts and Sciences at the University of Hartford provides a variety of undergraduate, graduate, and professional programs across numerous fields. With several departments, including the Department of Psychology, as well as research centers, internship and scholarship opportunities, and online program options, the College serves a diverse student population. The Department of Psychology offers an online Master of Science in Organizational Psychology degree program for students seeking to pursue a variety of careers that utilize organizational psychology principles. Students engage with in-depth coursework and hands-on experience through an internship or capstone project. The program utilizes a largely customizable curriculum, consisting of numerous elective courses, so that students may pursue niche interests in the field. Students prepare to pursue a variety of careers, including human resource manager, professional mediator, project manager, and chief executive. Students in the online Master of Science in Organizational Psychology program must complete an internship or a capstone project. The University of Hartford is accredited by the New England Association of Schools and Colleges (NEASC). The Chicago School of Professional Psychology offers a number of undergraduate and graduate programs that focus on practical learning, combining innovation and real-world experience. The International Psychology Department serves students through on-campus and online program options, international field experience opportunities, and professional development services. Through the Chicago School of Professional Psychology Online platform, the International Psychology Department offers an online Master of Arts in International Psychology degree program with three concentration options, in Environmental Advocacy, Management and Leadership, and Trauma and Group Conflict. The curriculum utilizes a blend of in-depth coursework and hands-on field experience to prepare students for success in international and multicultural psychology practice settings. Students engage with key concepts, including global mental health and human rights issues, cultural sensitivity, and ethics. Students prepare to pursue psychology careers in diverse professional settings, including clinics, advocacy groups, governmental agencies, and non-profit organizations. Students in the online Master of Arts in International Psychology program must a capstone project and nine-day international field experience. The Chicago School of Professional Psychology is accredited by the WASC Senior College and University Commission (WSCUC). The School of Behavioral and Social Sciences at the University of Louisiana at Monroe provides students with undergraduate, graduate, and professional program options in the fields of Criminal Justice, Gerontology, Political Science, Social Work, and Psychology. One of four schools housed in the College of Business and Social Sciences, the School of Behavioral and Social Sciences rounds out a diverse selection of programs represented in the College. The School provides access to internship and scholarship opportunities, research centers like the Social Science Research Lab, and student organizations like Psi Chi, the International Psychology Honor Society. The School of Behavioral and Social Sciences offers an online Master of Science in Psychology degree program with three track options, including the General Track, the Psychometric Track, and the Criminal Track. Each track includes different coursework requirements for completion, with the General Track providing the most elective coursework options. Regardless of the track chosen, the program develops a strong foundation of knowledge in the psychology field. Students engage in theoretical and practical approaches to the study of the field, engaging in such topics as research methods, behavioral theories, learning models, and ethics in psychology. Students prepare to pursue a variety of careers in the psychology field and beyond, as well as future doctoral study. Students in the online Master of Science in Psychology General Track program must complete a directed study project. The Psychometric Track and Criminal Track options require specific additional coursework. University of Louisiana at Monroe is accredited by the Southern Association of Colleges and Schools Commission on Colleges (SACSCOC). The Psychology Department at Sonoma State University, founded in 1960, build its graduate and undergraduate programs on the humanistic and existentialist traditions in the field. Through online program options, field experience opportunities, active research, and scholarship options, the Department serves traditional and non-traditional students alike. The Psychology Department offers an online Master of Arts in Psychology degree program with a Depth Psychology emphasis. The program develops advanced knowledge and skills in the field of depth psychology, in preparation for various forms of professional psychology practice. Through a blend of coursework, research, and field experience, students engage with key concepts of depth psychology, including understanding and applying Jungian archetypes, assessment and treatment, and cross-cultural mythology and symbolism. Students prepare to pursue a variety of careers in the field, including clinical practice and counseling, roles in governmental agencies, and academic research. Students in the online Master of Arts in Psychology program must complete an internship and culminating paper. Sonoma State University is accredited by the WASC Senior College and University Commission (WSCUC). One of eight departments at Medaille College, the Department of Social Sciences provides students with a handful of undergraduate and graduate program options in Criminal Justice, Homeland Security, and Psychology. Maintaining the mission and tradition of Medaille College, the Department of Social Sciences offers flexible program options for busy, working adults seeking to advance their careers through education, focusing on career-readiness and professional development. The Department of Social Sciences offers an online Master of Arts in Psychology degree program with an optional concentration in Sports Psychology. The program develops a balanced foundation of knowledge and skills in theoretical and practical approaches to psychology. The program utilizes a curriculum that blends theory and discussion with hands-on learning methods, emphasizing key aspects of the field, including developmental, cognitive, and evolutionary psychology, as well as core practices like counseling, and research methods. Students prepare to pursue careers in psychology in a variety of professional settings, including academic, private practice, research, and non-profit organizations. Students in the online Master of Arts in Psychology program must also complete an internship or a thesis. The program can be completed in one year, with courses utilizing a seven-week model. Medaille College is accredited by the Middle States Commission on Higher Education (MSCHE). The College of Letters, Arts, and Social Sciences at Eastern Kentucky University provides a variety of undergraduate, graduate, and professional program options across diverse field of study. The College houses several departments, including the Department of Psychology. Through online program options, student organizations, field experience opportunities, and research, the College serves students in meeting their personal and professional goals. Through the EKU Online platform, the Department of Psychology offers an online Master of Science in Industrial-Organizational Psychology degree program for students seeking to advance in a variety of careers. Students develop a balanced core of knowledge and skills incorporating fundamental aspects of the field, including performance management, organizational psychology, organizational development, and applying research. The curriculum blends in-depth coursework with hands-on experience through a practicum. Students prepare to pursue a variety of careers in the field of psychology and other professional areas, including human resources analyst, rehabilitation counselor, hiring manager, social service manager, developmental specialist, and employment counselor. Students in the online Master of Science in Industrial-Organizational Psychology program must also complete a practicum. The program utilizes eight-week course terms. Eastern Kentucky University is accredited by the Southern Association of Colleges and Schools Commission on Colleges (SACSCOC). The College of Graduate Studies serves the graduate program needs for Austin Peay State University, with a diverse array of programs and fields of study. Through numerous online program options, professional development services and resources, and field experience and scholarship opportunities, the College of Graduate Studies aids graduate students in their pursuit of professional success through advanced education. The College of Graduate Studies offers an online Master of Science in Industrial-Organizational Psychology degree program for students seeking to advance in a variety of professional roles. The program incorporates theoretical and practical approaches to industrial-organizational psychology. The curriculum covers key aspects of the field, including personnel assessment, leadership models and applications, organizational change, and personnel psychology. The program includes a thesis and non-thesis options for completion. Students prepare to pursue a variety of careers, including chief executive, human resource manager, personnel manager, and project manager. The College of Letters and Sciences at National University provides a variety of undergraduate and graduate program options across four departments, including the Department of Psychology. With flexible online programs, field experience opportunities, scholarship options, veteran services and resources, and professional development services, the College meets the needs of a diverse student population. The Department of Psychology offers an online Master of Arts in Performance Psychology degree program for students seeking to pursue careers applying performance psychology concepts. The program blends aspects of psychology, counseling, and sport science. The curriculum blends in-depth coursework and hands-on field experience. Students engage with key concepts, such as theoretical and practical approaches to performance psychology, ethics, organizational behavior, psychopathology, and theories of behavior and change. Students prepare to pursue careers in a variety of professional settings, including university and professional sports, school and community programs, corporations, coaching, and teaching. Students in the online Master of Arts in Performance Psychology program must complete a fieldwork experience. National University is accredited by the WASC Senior College and University Commission (WSCUC). Making up half of National Louis University, the College of Professional Studies and Advancement provides a wide variety of undergraduate, graduate, and professional program options. With three schools under its umbrella, including the School of Social and Behavioral Sciences, the College serves students through numerous resources, including online program options, field experience opportunities, and scholarships. The School of Social and Behavioral Sciences offers an online Master of Arts in Psychology degree program with concentration options in General Psychology, Community Psychology, and Teaching of Psychology. The program develops a balanced foundation of knowledge in theoretical and practical approaches to the study and application of psychology. The program emphasizes the importance of critical thinking and ethics through coursework that covers fundamental and advanced topics in psychology, including cognitive psychology, research methods, abnormal psychology, statistics, and psychological assessment. Students prepare to pursue careers in education, practice, and research. Students in the online Master of Arts in Psychology program must complete a thesis project or a comprehensive exam. National Louis University is accredited by the Higher Learning Commission (HLC). A master’s in psychology degree signifies that an individual has completed a comprehensive, graduate-level program in the study of psychology, either as a general subject or in a niche. Master’s in psychology degree programs typically cover the field’s major theoretical aspects, including social psychology, industrial/organizational psychology, cognitive psychology, developmental psychology, and clinical psychology. They also explore practical aspects of the field, such as research, data analysis, and assessment. Some programs, such as master’s in applied psychology degree programs, equip students with the skills to apply their knowledge in areas not typically considered part of the psychology field, such as marketing. Others focus on niche applications of psychology, such as in schools or clinical practice. Students who pursue their master’s degree in psychology online may choose from a variety of specializations. For example, if you want to use your understanding of human behavior to design employee training programs, you may consider concentrating in industrial-organizational psychology. The links below provide more information on some of the most common branches of psychology. Online master’s in psychology programs generally offer more flexibility and convenience than on-campus programs. For example, in asynchronous online programs, you can watch lectures and complete assignments from any location, whenever your schedule permits. This makes it easier to balance studies with a job or family obligations. In synchronous programs, you may still study from the comfort of your own home, but you must do so at set times each week. Some online programs also allow for self-paced learning. In these programs, students advance through their coursework as they demonstrate mastery of the material, whether by taking an exam or submitting a portfolio of work. Self-paced programs enable students to earn their degrees on an accelerated timetable, but they require excellent self-motivation and time management skills. If you learn best when you can interact regularly with an instructor and classmates, think carefully about whether you should follow a self-paced track. Distance education does come with its own set of challenges. For instance, graduate programs that lead to licensure, such as school psychology and industrial-organizational psychology programs, may require a field experience or internship. Online students may need to work harder to identify an internship site in their area. What Are Some of the Advantages of a Master’s Degree in Psychology? Some of the advantages of a master’s degree in psychology are that a bachelor’s degree in psychology can prepare you to work as a market research analyst or training and development specialist. However, you must hold an advanced degree to work as a psychologist. Master’s graduates qualify to work as school or industrial-organizational psychologists. This degree also opens the door to clinical and other advanced jobs in the field. To receive a license to diagnose and treat mental disorders, for example, you typically must earn a doctorate in psychology. Many doctoral programs require applicants to hold a master’s degree. There are two kinds of psychology doctoral degrees: a doctor of psychology (Psy.D.) degree and a Ph.D. in psychology. Psy.D. programs focus on the development of clinical skills, preparing graduates for direct work with patients through practicums and internships. Ph.D. programs, conversely, prepare students for roles in research and academia. Rather than focusing on field work, students pursuing a Ph.D. must write a dissertation based on original research. You can do many things and pursue many career paths with an online master’s in psychology degree. Some programs provide a narrow focus, while others adopt a more general approach. Still others focus on the application of psychology principles in professional settings outside of the immediate field of psychology. The following list highlights some jobs a master’s in psychology graduate might pursue. Some of these positions require specialized licensing. School Psychologist: School psychologists help individual students overcome learning and behavioral problems. They may also consult with teachers and administrators to design broader educational strategies and school-wide policies. School psychologists must hold at least a master’s degree. Industrial-Organizational Psychologist: Industrial-organizational psychologists apply their understanding of human behavior to the workplace. They may study workflows to improve productivity, design programs to onboard new hires, or oversee initiatives meant to boost employee morale. Marriage and Family Therapist: Working with individuals, couples, and groups, marriage and family therapists help their clients address challenges in their lives and relationships, such as divorce or unemployment. Licensure in most states requires an advanced degree. Mental Health Counselor: Mental health counselors provide therapeutic services focused on issues such as anxiety, grief, depression, and suicidal ideation. They may specialize in working with certain populations, such as the elderly or college students. Clinical Psychologist: Clinical psychologists perform many of the same functions as mental health counselors, though they may also formally diagnose and treat mental, emotional, and behavioral disorders. To receive a license, clinical psychologists must hold a doctoral degree. How Do I Choose an Online Master of Psychology Degree Program? When researching online master’s in clinical psychology programs, consider all your options. For example, public, in-state schools typically offer the lowest tuition rates, but you may find an online program in another state offering concentrations and coursework that better align with your professional goals. If you plan to continue your education at the doctoral level, you may benefit from a program with a thesis requirement. If you want to earn your degree as quickly as possible, you may consider a program that allows you to study at your own pace. Take the time to find a school that fits your unique needs. Program Cost: Many public universities offer discounted tuition rates to in-state students. Other schools may provide grants or scholarships to members of the military or applicants who excelled academically during their undergraduate studies. Remember to consider other related educational expenses, such as books, course materials, and technology fees. Transfer Policies: Those with previous graduate-level classes can often apply these credits toward a master’s degree at a different institution. Graduate schools often limit the total number of credits you can transfer, and you usually must maintain a minimum GPA to qualify. Contact your program coordinator or university registrar for more specific information. School Size and Type: The size of your school helps shape your educational experience. Students at smaller schools often enjoy more direct access to their instructors and more intimate relationships with their classmates. Students at larger schools may benefit from more extracurricular opportunities and a greater diversity of perspectives and opinions in the classroom. Program Length: Most online master’s programs in psychology consist of roughly 60 credits, requiring 2-3 years of full-time study to complete. Part-time students may need anywhere from 4-5 years to meet all their graduation requirements. Some schools offer accelerated programs, allowing students to earn their degrees in 18-24 months. On-Campus Requirements: Students who attend psychology master’s programs online may still need to visit campus for brief residencies at the start or end of their graduate studies. Some programs also require students to take exams on campus or at proctored test centers. If required, make sure these campus visits fit your schedule prior to enrolling in a program. Thesis, Fellowship, and Work Requirements: Research-oriented programs often require students to conduct original research and write a thesis, preparing them for jobs in analysis or the doctoral dissertation process. Practice-oriented programs, by contrast, may require students to complete a practicum, internship, or other supervised clinical experience, giving them the opportunity to hone their skills in a real-world setting. When thinking about where to earn your master’s in psychology online, make sure to find an accredited program. Through the accreditation process, colleges and universities demonstrate that they meet certain academic standards and adequately prepare their students for careers. If you choose an unaccredited program, you may not qualify for state and federal financial aid opportunities. You may also struggle to find work or meet state licensure requirements. The school that offers your program may hold either regional or national accreditation. Public and nonprofit universities typically seek out regional accreditation, which is generally considered the more prestigious of the two forms. For-profit and vocational schools may instead receive national accreditation. Due to different standards, regionally accredited universities may not accept transfer credits from some nationally accredited institutions. Programmatic accreditors, such as the American Psychological Association, tend only to accredit doctoral-level programs in psychology. To check whether your school holds either regional or national accreditation, search the Council for Higher Education Accreditation’s online directory. How Long Does It Take to Complete an Online Master in Psychology Degree Program? Most full-time students earn their online master’s degree in psychology in two years. Part-time students may need 3-4 years to meet all their graduation requirements. Students in accelerated tracks can advance through their coursework at their own pace. These self-paced programs require students to demonstrate their understanding of core concepts by taking exams or submitting portfolios of work. While this style of learning may allow you to earn your degree faster, it requires exceptional self-discipline and independent study skills. You may also graduate in less time by applying credits earned in prior graduate-level classes. Most online master’s programs in psychology comprise about 60 credits, and some schools allow students to transfer up to half of the credits required for an advanced degree. Exact requirements vary among schools, but you must maintain at least a 2.5 GPA in these classes to receive transfer credits. Online master’s programs in psychology often allow students to select an area of concentration, preparing them for doctoral study or specialized professional roles. Students tend to take foundational classes in their first year of the program and most of their concentration-specific coursework in their second year. Educational psychology involves the scientific study of human learning from both cognitive and behavioral perspectives. Coursework in this area touches on subjects such as the role of education technologies, instructional design, curriculum development, classroom management, student motivation, and the organizational structure of schools and other educational settings. Forensic psychologists use their expertise within the justice system. They may serve as expert witnesses, assess an individual’s competence to stand trial, or provide support to victims and their families. Students who pursue this specialization often take coursework in neuropsychology, clinical counseling, and legal principles — such as the exclusionary rule. Industrial-organizational psychology focuses on the workplace. Students learn to conduct research on employee behaviors and attitudes, using their findings to inform hiring practices, training programs, and management systems. Industrial-organizational psychologists often work in human resource departments or as independent consultants serving multiple clients. Health psychology examines both how mental processes intersect with an individual’s health and the delivery of healthcare more broadly. For example, a health psychologist may work with a patient to identify and overcome the underlying reasons behind their addiction to tobacco. This concentration combines coursework in areas like anatomy and epidemiology with more traditional psychological subjects. Students who choose to concentrate in counseling psychology often plan to pursue a doctorate and apply for a license as a clinical or counseling psychologist. As such, this concentration often features coursework in research methods, theory, and design to prepare students for the doctoral dissertation process. Students may also begin completing supervised clinical experience requirements for licensure. This course provides an overview of all human development phases, including prenatal, adolescent, adult, and late adult. Students learn about the various biological, cognitive, and emotional changes that take place during each of these phases, along with common developmental disorders that may arise due to internal or external factors. Culture plays a critical role in shaping human behavior and cognition. For example, people from Western cultures tend to view themselves as more independent and individualistic, whereas those from Eastern cultures may define themselves more in terms of their relationships with others. The class emphasizes the importance of cultural competency in both practice and research. In this class, students examine the prevailing theories and schools of thought behind personality and personality assessment approaches. Students also explore individual, cultural, and gender differences in personality, allowing them to construct a framework for better understanding their patient’s or subject’s feelings, motivations, and thoughts. Students in this course closely analyze cognition, emotion, and their relation to human functioning. Topics covered include knowing acquisition and knowledge representation, language and related components of thinking, affective functioning, and emotional regulation. Students also explore subjects like the construction of reality, the representation of self, and psychopathology. Many students pursue an online master’s in psychology as a stepping stone to a doctorate. This course introduces concepts integral to the doctoral dissertation process, including how to collect both quantitative and qualitative data, the ethical implications of conducting research within psychology, and the most effective methods for presenting and disseminating one’s findings. American Psychological Association: Founded in 1892, the American Psychological Association boasts over 115,700 members. The APA maintains a commitment to excellence in the field through establishing ethical standards. Members of the APA benefit from access to publications and databases, along with professional conventions and research funding opportunities. The APA provides resources for students seeking graduate and postdoctoral education, including application advice, accredited program lists, information on program requirements, and career development resources. The APA also oversees the American Psychological Association of Graduate Students, offering unique resources and benefits for graduate students in the field. Psi Chi, the International Honor Society in Psychology: Initially chartered in 1929 at Yale University, Psi Chi offers membership to undergraduate and graduate students in psychology through chapters located at universities worldwide. Members benefit from award and grant opportunities, conventions and conferences, and access to publications produced by the organization. Association for Psychological Science: Since 1988, the Association for Psychological Science has committed to progress in psychology through research, working in the public interest, protecting scientific values in education, removing barriers to accessing the field, and transparency. Members join a community of over 30,000 scientists worldwide, enjoying benefits such as international conventions, access to publications and resources, funding opportunities, and publication opportunities. International Association of Applied Psychology: Dedicated to advancing discourse in the field and improving the world through the application of psychological science, the International Association of Applied Psychology engages in partnership with the United Nations, the World Health Organization, the International Labor Organization, and other significant international groups. IAAP members enjoy a variety of benefits, including access to journals, databases, and libraries worldwide; funding opportunities; and participation in IAAP initiatives. What can I do with a Psych degree?